Last night I went to the Salem library to see the documentary film The Reluctant Radical, followed by a Q&A with the filmmaker and the subject of the film, Ken Ward of Portland. The link has a trailer for the film. 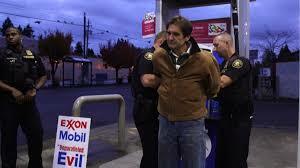 The movie follows Ward, a 20-year employee of Greenpeace who then went out on his own to protest fossil fuels. It showed him trying to get in front of a Royal Dutch Shell ship leaving for the Arctic in 2015 -- the protest in Portland where about, notably, a dozen or so Greenpeace activists hung from a bridge, trying to keep the ship in harbor. (Actually the ship was a required vessel to deal with well blowouts that might happen in the Arctic.) Ward is shown at a Mobil gas station -- once on Christmas Eve dressed in a Santa suit -- with a sign board saying "Evil" and passing out an informational page about the news that ExxonMobil knew about human-caused warming in the 1970s. (He was arrested there more than once, and received community service.) Last, he broke into an oil pipeline safety valve station and turning the valve shut, temporarily blocking tar sands oil coming to the US from Canada. For this last act he faced several charges for trespassing, breaking and entering, and one felony (I forget what for), but a jury in Washington state deadlocked ("hung") on all the charges. And, as of the time of filming, he faced other charges too. Ward has very strong and dire opinions on climate change. Some you can hear in the film: "the world as we know it is ending," we are at "the end of conditions that make civilization possible," "we're fucked," "we need to remake society or we're fucked." "We need moral clarity, lines to be drawn." His 15-year old son was shown saying "the world's [the human species is] screwed no matter what we do." Ward is a very committed man, brave, willing to take risks that few are. I didn't know how I felt about that before the film, and after seeing it and hearing him, I still don't. His protests, of course, don't directly stop any fossil fuel use. But it does draw attention to the problem, and I suspect he's made some number of people wonder why he goes to such lengths, drawing their attention to the issue. Others, of course, see him as a zealot and a nuisance. In the film a district attorney in Massachusetts said, when he decided to drop charges against Ward from earlier actions in that state, that we revere the civil disobedience of the Boston tea party. Martin Luther King Jr and Gandhi used civil disobedience to great effect. Someone in the jury in Ward's trial that ended the film must have thought the same of Ward. These falsehoods matter. For me, they are egregious enough to make me doubt everything and anything he says about climate change. But then I know the subject well; most in the audience didn't. (One question was from a woman who said they had taken a trip to North Dakota, and the region was rife with oil trains. Where are they all going, she asked. Into your gas tank I wanted to say, but didn't.) I don't see Ward's errors as much different from some of the falsehoods put forth by climate deniers -- at least, the ones who clearly don't know any science. (Professional liars like Heartland and Watts are a different group.) You've got to get your facts straight if you're going to advocate. You gotta. And at one point last night Ward said that coal power plants like those in West Virginia should all be simply shut down tomorrow. That's way beyond radical -- it's stupid. Ward called cap-and-trade, which is being designed now in the Oregon legislature, "a terrible idea, far more of a problem than it's worth," and that the time to do it was 20 years ago. I used to wonder about the Berrigan brothers, who were in the news for a few decades during the '60s and after. Both priests, they first protested the Vietnam War, then political injustice in general, then protested a nuclear armament facility by breaking in, destroying some things and pouring blood on documents. They both spent several years in prison, in total. Did they do any good? I think, for me, they made me think, and in some small way contributed to my overall progressivism. I couldn't do what they did, or what Ken Ward does, though. I don't know if that makes me a coward, or just rational. I tell myself I can't protest because I write about climate change and I shouldn't look biased. Like I matter or anyone would notice. Maybe that's just fear rationalizing. I tell myself I don't have the personality they do, and their all-or-nothing, black-and-white thinking. But then it's not just a matter of personality -- the film shows Ward talking to himself before chain cutting his way into the safety valve area, and saying he was afraid. I'm sure he is sometimes. He seems sincere. Maybe we all need to be that angry, at least to making changes in the political arena. We're all so passive. I just wish he'd stop exaggerating the science. Who Gets How Much in a Carbon Tax-and-Dividend?